I also installed the test repo version 6. I only have Linux guests and did not to have install guest additions per guest. I set up shared folders on a Manjaro KDE Linux guest but could not see shared folders. In the past they appeared in a /media folder, but no such folder exists. To be honest I have not used VBox for some time so maybe another mechanism exists to see shared folders. The only thing extra you need that's not in the metapackage on the host is virtualbox-ext-pack to automatically get and install the matching extension pack. Dependency issues prevented me from adding it to the metapackage. You do have do set up/build guest additions on the guest if they don't come with them already, like MX does. I suspect that's the problem with Fedora, since the guest additions are non-free, and they don't ship with any non-free stuff at all. I forgot when I found this out... old, bad memory. Time for some new RAM, I guess. But anyway, I have noticed that previous versions of VB seem to get all the privs correct (magically) when the whole boat is loaded. So I just install everything. I have to say... VBox 6 works nicely with 4.20 of the kernel. We now have Virtual Box 6.0.4 in the test repo, with 5.2.24 moving to main. The new version seems to be ignoring theme colors--you can have any GUI color you like as long as it's stark white. Previously (within the last 7 days) the text was white on white on my Arch-based distro when I used a dark gtk theme. 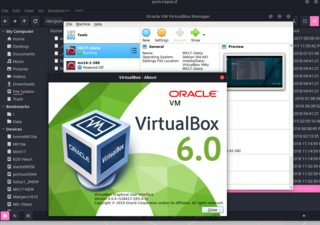 But I just upgraded my Fedora 28 (formerly Korora 27, so I'm not sure if they had previously added some theming/environment tweaks) to Fedora 29 yesterday, and a few hours ago I installed Virtualbox 6.0.4 directly from Oracle's virtualbox.repo. Had to manually download and install the Extension Pack from Oracle. I didn't use the Virtualbox -style commands above. The VB theme doesn't follow the system's dark theme but now at least the text displayed in the VB Settings window is black on white background, rather than white on white. Shimmer effect is still present but that's not an issue if the text is now legible. Virtual machine was an MX17.1-beta, and the Shared Folder within continued to automount and work. The test repo packages have been updated to the latest 6.0.6 release, backported from Sid, along with the -ext-pack and -guest-additions-iso packages.